Rovers RV Park welcomes you! Don't Panic! If you were looking for Chinook RV Park, you've found us! We've just changed our name! Same great service, same friendly owners. Hopefully less confusion with the other "Chinooks" in the area! Our park is small, peaceful, safe and very pet friendly with a much-loved area where your dog can run off-leash. You can fish or kayak right from our wetlands. Or just sit by the river and enjoy the spectacular view. Your pets will love it here - and so will you! 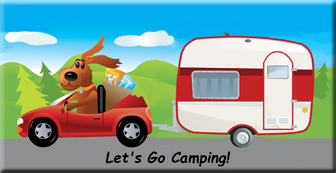 Rovers RV Park sites are large with plenty of space to enjoy our long summer evenings. We have a large communal greenspace and fire pit area. We actively encourage recycling and strive to be as green as possible with our campers’ help. 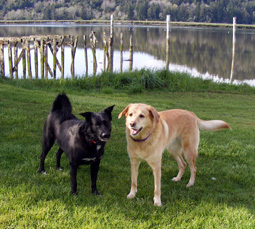 We are located on the Alsea Bay and River, famous for its Dungeness crab and Chinook salmon, and just 3.3 miles from Hwy 101 and the spectacular ocean beaches where you can whale-watch, hunt for agates, beachcomb for treasures or just walk for miles with your dog! The Port of Waldport has a public boat launch and a public crabbing dock, with pots and boats available to rent from local businesses. Rovers RV Park is a great location for touring the Central Coast – Yachats and Florence to our south, Newport, Depoe Bay and Lincoln City to our north. Lots of sunshine and spectacular sunsets! We are a bit of a unique micro-climate. Usually when the coast is socked in with a marine layer, we're sunny and clear. We don't experience the high winds found along the coast. But we're still close enough to enjoy the cooling effects of the ocean. Think of us as the Oregon equivalent to Hawaii - mid 60s to mid 80s with a light breeze!